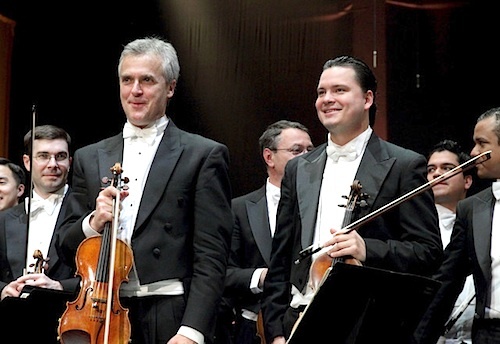 February 7, 2012, 9:25 PM · "Is Mahler 8 now your favorite Mahler symphony?" 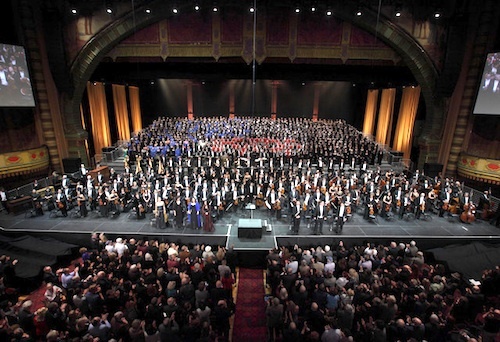 asked my son, Brian, 11, after he performed Saturday night with 1,027 people on the stage of the Shrine Auditorium, including conductor Gustavo Dudamel, the Los Angeles Philharmonic, Simón Bolívar Symphony Orchestra of Venezuela, seven soloists and 16 choirs. I don't know about mine, but I'm pretty sure it's his favorite symphony now. He and his friends in the Los Angeles Children's Chorus spent some 40 hours in the week before the concert, rehearsing and performing this piece. The kids started learning their parts months ago, with the help of their director Anne Tomlinson. 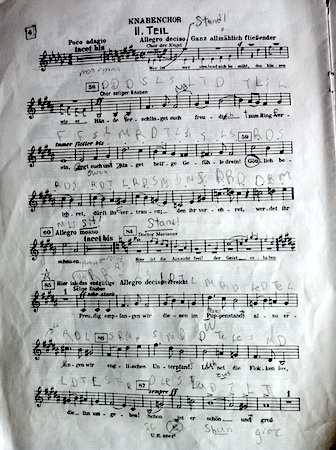 The first movement is in Latin, the second movement is in German, but first they learned it all in solfege. They attended rehearsals at six different venues all over town, arranged their schoolwork around rehearsals, rode in carpools and generally worked very hard. After the concert, they were downright euphoric. Sitting among 4,700 audience members, realizing that many of them were in some way related to the 1,000+ people on stage for this event, I had a little revelation about how you attract a crowd to a concert, and about how you create a fan of symphonic music. It's quite simple -- and profoundly complex: ask 1,000 to share the stage, then invite everyone involved to come to the concert. In the audience I noticed parents of young singers; spouses and friends and children of older singers; music teachers; administrators from all the organizations, regular symphony-goers; and the list goes on. On the stage were 1,027 who will never forget the experience, and who will always feel a connection to the Los Angeles Philharmonic. It was a tremendous endeavor for every singer, every instrumentalist, for the 91 musicians who traveled here from Venezuela to play, for the music directors, for all those behind the scenes who booked all the venues, raised the money -- for the that lady who decided where every singer would stand, for the librarian... Good heavens, it boggles the mind! But classical music isn't "easy," it never will be, and no marketing department can make it so. Do you want an audience? Do you want music in your community? You will have to work, and so will they, and then you'll get the most devoted audience you can find. Music brings together a community like nothing else, and Los Angeles Philharmonic Orchestra director Gustavo Dudamel knows this. 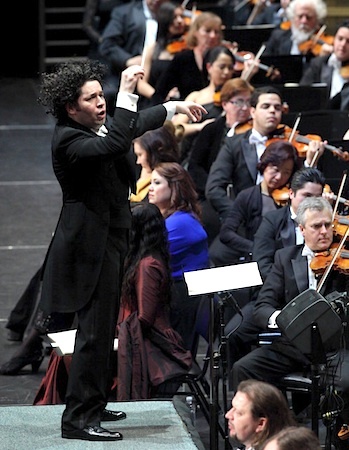 Dudamel grew up as part of Venezuela's El Sistema, started in 1975 as a social program to help underprivileged youth. It now includes 125 youth orchestras as well as a system of music schools that teach 250,000 children. Though this was Dudamel's first time conducting the "Symphony of 1,000," as Mahler's 8th is called, it certainly was not his first time conducting a humongous orchestra. How was the performance? Mahler 8 has only two movements. Based on the Latin hymn "Veni creator spiritus," the first movement blasts into being: organ, voices, brass, strings -- nearly all forces go full-forward from the first measure. Sitting on the ground floor, almost under the stage, I felt that a lot of the sound, and the diction, was flying over my head. It was hard to keep track of such a wash of noise. I enjoyed the way the members of the LA Phil mixed with the members of the SBSOV -- young and old, male and female, Venezuelan and melting-pot Californian. Musicians from both orchestras took leading roles for this performance: Martin Chalifour of the LA Phil was concertmaster, Moises Medina of the SBSOV was Principal Second Violin; Carrie Dennis of the LA Phil was Principal Viola; and Edgar Caldero of the SBSOV was Principal Cello. As the second movement progressed passed the instrumental introduction, the choir entered quietly, syllable by syllable. I enjoyed the soloists most when they sang on their own; baritone Brian Mulligan was riveting; bass Alexander Vinogradov sang his heart out, with turbulent violins underneath; Burkhard Fritz's well-supported and beautiful voice hit the high notes during an extended solo. The appearance of Swedish mezzo-soprano Charlotte Hellekant, was so theatrical, alone in the dark balcony on the right, up-lit and glowing gold, like Tinkerbell without wings. As she sang the words, "rise up to higher spheres..." and I half-expected her to levitate! From the stage, sopranos Julianna di Giacomo and Manuela Uhl sang Mahler's impossibly high notes, with the whole choir growing in volume behind, and everything rising. The choir burst forth in unison, backed by the organ. From the other balcony, a choir of brass instruments blasted, back on stage cymbals chimed, organ, trumpet -- so much sound! The music stopped and the applause went on for 15 minutes. The person behind me said, "We pulled it off!" No doubt, thousands of people thought the same. February 8, 2012 at 03:45 AM · what an amazing undertaking! February 8, 2012 at 01:21 PM · I was lucky enough to be in an orchestra that did the 8th at Symphony Hall and Carnegie. A wildly fun piece to perform-- and not quite so hard as many of the other Mahlers, at least for individual players. If the conductor doesn't control volume and balances, it can turn into a real scream-fest. February 9, 2012 at 02:24 AM · Wish there wss a video of this. I'm sure there is, but will it ever surface. February 9, 2012 at 07:12 PM · I did hear that they will be releasing a recording of the performance of Mahler 9 from this cycle. As for 8 -- not sure! They are going to perform it down in Caracas, Venezuela, (with different singers but the same orchestras, and Dudamel, of course!) and you can go see the performance live-broadcast at movie theatres on Feb. 18. Here is the link: http://www.laphil.com/tickets/performance-detail.cfm?id=4805 Just go there and put in your zip code, to find a theatre near you.